Crinkles is a Shar-Pei mix who made many friends during his visit to KEZI as Pet of the Week. EUGENE, Ore. – Crinkles was a big hit during his visit to KEZI 9 News as Pet of the Week on Tuesday. 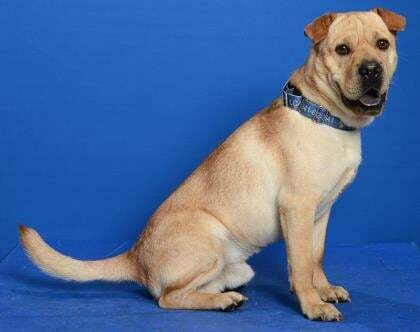 This lovable 6-month-old Shar-Pei mix is looking for a fun family who will appreciate his sweet, playful personality. He will also need a family who will commit to continuing his training and enrichment. Crinkles can live with children who are willing to give him time and space to settle into his new home. He may be able to go to a family with other pets, as long as introductions are slow. Crinkles traveled well in the car on the way to KEZI, and was friendly to everyone he met during his visit to the news station. He weighs about 30 pounds, but he is still growing. His adoption fee is $300, which includes the cost of vaccinations, microchip identification, spaying or neutering, a certificate for a free veterinary exam and more. If you are interested in Crinkles or any other animals at Greenhill Humane Society, call 541-689-1503 or click here.